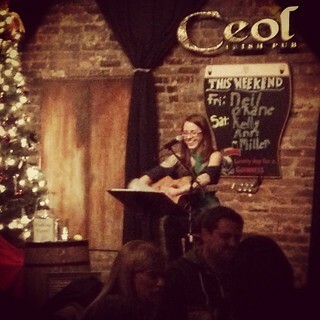 2012 ended with an amazing Saturday night at Ceol Irish Pub here in Reno, NV. Then I drove the next day to Redding, CA for a New Years' Eve party I played at Indian Peak Vineyard in Manton. Definitely a good way to end the year! What wasn't so fun was the car trouble that stranded me in Redding a few extra days. 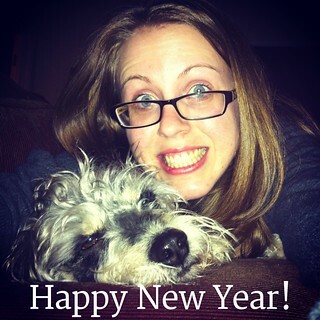 Thankfully, my dog Henry and I were in very good company! Here is a picture shared by the wonderful Amanda Curren from last weekend and Henry and I at midnight on January 1 pretending not to be tired. We went to sleep almost immediately after taking this exciting "selfy"
Hope to see more friendly faces on Saturday night at Ceol's!